With spring already here and the mountain of spring cleaning you are planning to tackle, it might make sense to spring clean your vacuum before you start. It can help it perform better and make the cleaning so much easier than you might imagine. It will depend on your vacuum as to the amount you can take apart to clean and the installed filters, which help remove the dust particles from stopping the motor from working, sometimes can cause overheating if any vent gets blocked and this is dangerous. There are a couple of areas you must check before you spring clean your vacuum, as they could potentially need repairing or if this is not possible a new-to-you vacuum might be required. The plug and the cable, check that they both are in good working order, not broken or damaged in any way. If your plug’s cracked, you must replace it, if your cable has any fraying or damage it is important to seek professional advice as to whether this is replaceable or if it means a new vacuum. Only when you have checked these areas should you consider moving on to cleaning the vacuum. My vacuum has filters which I clean every 6 months, they are great because they are washable; some filters you need to buy new, sometimes you can get away with shaking them and tapping the dirt out in between purchasing new ones. I wash mine as per the manufacturer’s instructions and allow them to air dry, this does mean my vacuum is out-of-order for at least two days. My vacuum is a bagless variety and gets emptied after each use, so when I wash my filters I take this opportunity to wash the dust collection chamber too, I allow this to air dry also. Before you attempt this, check your manufacturer’s instructions. Mine allows for this deep clean, other varieties might not. If you have a bag it is important to empty and replace frequently, they become less efficient the more dust particles they hold. Brush out any dust particles to ensure that the vacuum is as clean as possible. I am able to remove the brushes from the bottom of my machine and this enables me to remove any tangled hair or thread, making the brushes work more effectively. Check all hoses to ensure there are no blockages, and the hoses are intact, often you can buy replacement hoses if you notice any damage. Holes in the hoses will reduce the suction power and make your machine work less effectively. If you have a blockage it is possible to remove these with care, you don’t want to make the blockage tighter packed, try using a wire coat hanger that you have straightened out, but be careful you don’t puncture the hose. I like to dust my vacuum as I put it back together to ensure that there is no dust or dirt, making it look great and they work so much better too. A clogged air vent can make the vacuum work harder than necessary and cause it to burn the motor out so it is no longer viable to work. 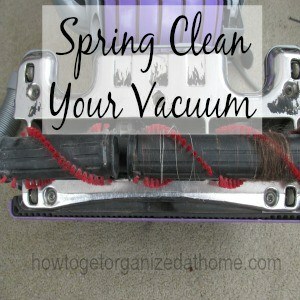 Therefore, regular maintenance of your vacuum could increase its life and this saves you money. I desperately need to clean our little handheld vacuum. It’s not working very well right now.